Following the analyses and optimizations discussed in the preceding chapters, practical aspects are now discussed in the context of design and control of underactuated hands. 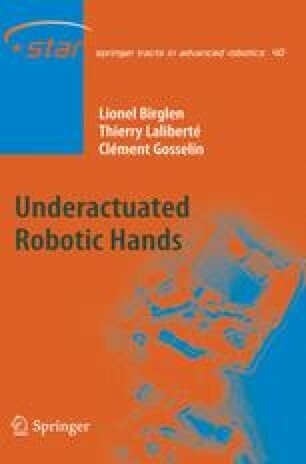 Several prototypes of underactuated hands built at Université Laval are extensively presented in this chapter. The analysis and optimization of underactuated fingers (Chapters 3–5) as well as the available techniques to extend the underactuation between the fingers (Chapter 6), naturally lead to the design and control of actual prototypes. Such prototypes demonstrate the behaviour and capabilities of this technology. First and foremost, in an underactuated hand, several fingers are required to grasp an arbitrary object. Hence, the first section of this chapter focuses on selecting the necessary number of fingers and their relative positions. The hands presented in this chapter are mainly intended for use in hazardous environments, e.g. in space. Successful grasping in a spatial environment is an important issue addressed in the literature. More specifically, in (Foster and Akin 2001), a study of the different grasping requirements for 242 existing crew aids and tools as well as during extravehicular activities (EVA) showed that over 50% of the grasps were cylindrical and three-fingered hands achieve over 90% of the required tasks. The results presented in the latter reference were used to orient the design choices presented in the subsequent sections.